...despite some sunny skies, the sightings along the Lehigh and Trenton Lines were almost non-existent. Prior to my arrival in Three Bridges, LEHL NS trains 11J headed west and then 18G and 22V would come east. 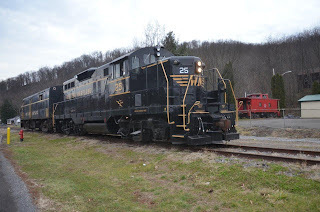 NS 21M got the block signal at MP 48 that it would be taking the siding at Flemington Jct (MP 51) while NS 212, with NS 9928 as the leader and is seen here passing through Three Bridges around 10 AM on Saturday. 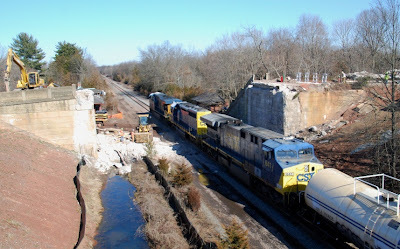 President's Day was just as quiet along the CSX's Trenton Line. 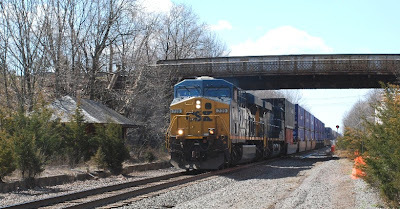 CSX 770, with CSX 2692 and CSX 2804, is seen heading east at Belle Mead with its short consist of mixed freight. 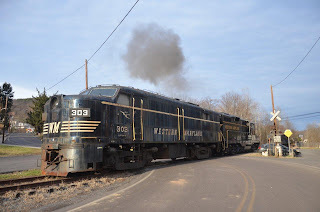 NORFOLK, Va. - To celebrate the 30th anniversary of the Norfolk & Western/Southern merger in 1982, Norfolk Southern plans to honor many of the railroads that make up the present day NS system. 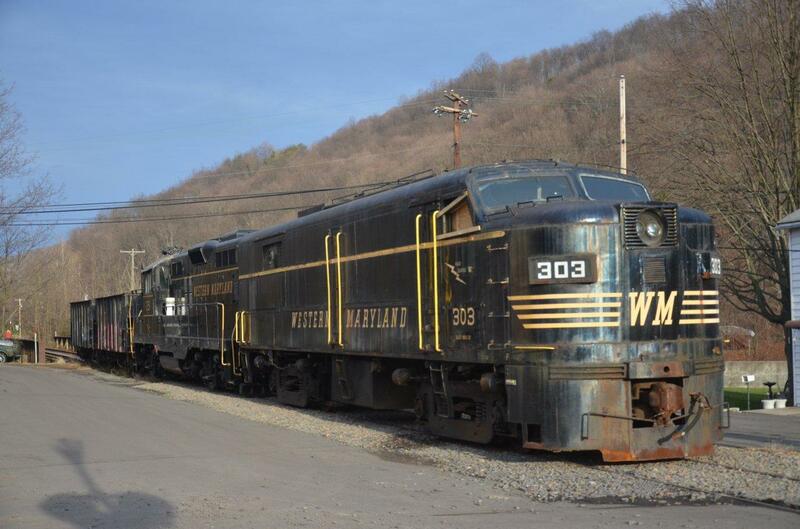 Norfolk Southern plans to create a fleet of heritage locomotives: 18 units honoring a wide variety of predecessor roads. The locomotives will be 10 SD70ACes on order from EMD that are being constructed at its Muncie, Ind., plant, and eight ES44ACs from an upcoming order for 25 units from GE. While EMD will paint all 10 heritage units in-house, NS forces will paint the eight GEs. 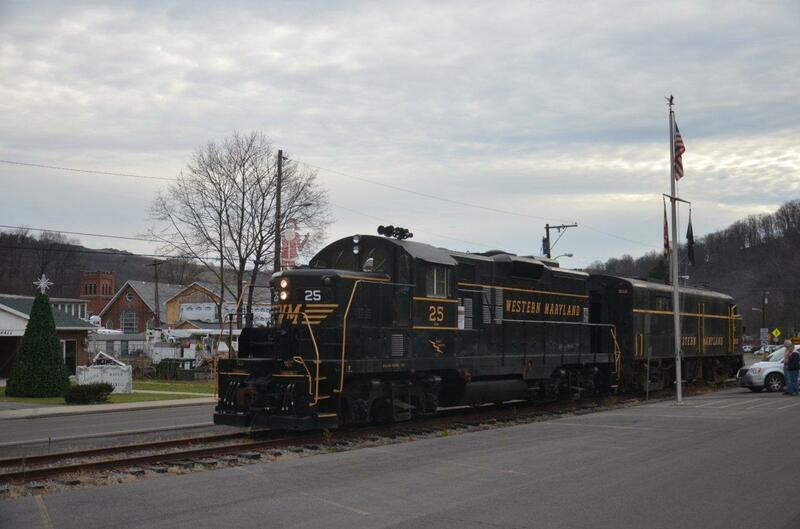 The railroad's Altoona, Pa., shop will paint five, while the Chattanooga, Tenn., shop will handle three heritage units. 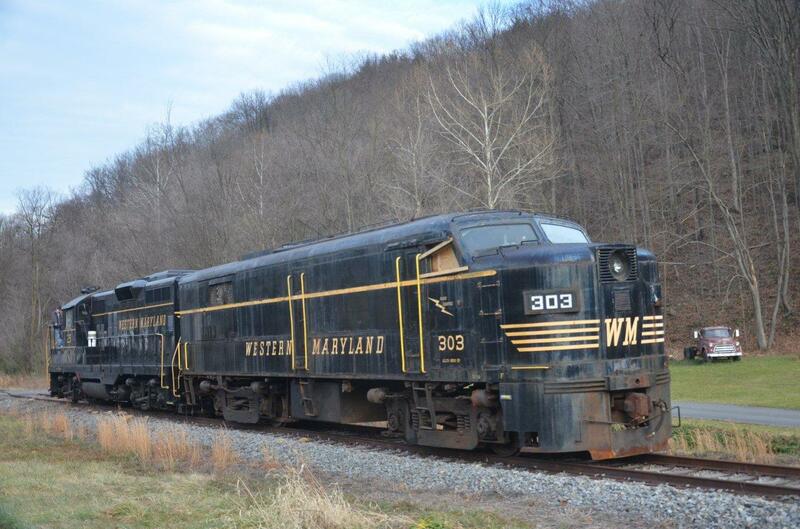 NS plans to recreate the paint schemes as accurately as possible. By contrast Union Pacific, a half-decade ago painted several units to honor the merged companies that make up today's UP, used the old railroads' logos and colors, but created new interpretations on the old liveries. 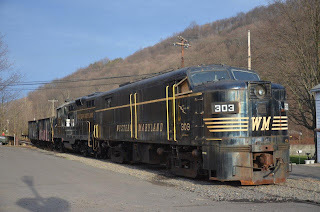 NORFOLK, VA. – Dynamic Fuels, LLC and Mansfield Oil Company have signed an agreement to supply renewable diesel to Norfolk Southern Corporation (NYSE / NSC), one of the nation’s largest transporters of coal and industrial products. 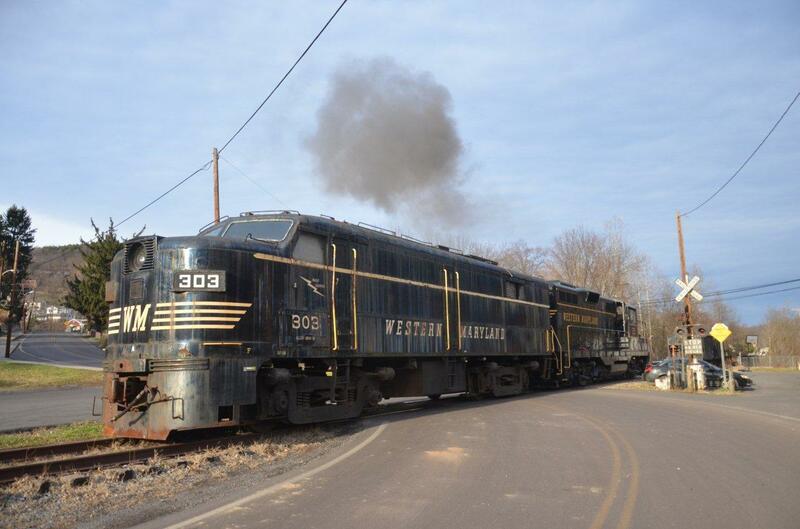 Norfolk Southern has primarily been using a 100% pure Dynamic Fuels renewable diesel at its Meridian, Mississippi rail yard since early January. Dynamic Fuels, a 50/50 venture owned by Tyson Foods, Inc. (NYSE / TSN) and Syntroleum Corporation (NASDAQ / SYNM), recently signed commercial off-take and strategic alliance agreements with Mansfield to market renewable diesel to fleet customers. Dynamic Fuels, operator of the first commercial advanced biofuels plant in the United States, produces next-generation renewable and synthetic fuels from animal fats and greases. The company’s Geismar, La., plant produces renewable diesel as “drop in” fuel that can replace 100% of petroleum diesel in a diesel engine without engine modification. Ranked as one of the Top 50 privately held companies in America by Forbes magazine and a multiple category finalist in the 2009, 2010 and 2011 Platts Global Energy Awards, Mansfield defines the next generation transportation fuels company. Founded in 1957, the company has achieved double-digit growth for three decades by focusing on optimizing and controlling fuel-related costs for its customers using innovation, technology and high touch service. For more information, visit http://www.mansfieldoil.com/. Tyson Foods, Inc., founded in 1935 with headquarters in Springdale, Arkansas, is one of the world's largest processors and marketers of chicken, beef and pork, the second-largest food production company in the Fortune 500 and a member of the S&P 500. The company produces a wide variety of protein-based and prepared food products and is the recognized market leader in the retail and foodservice markets it serves. Tyson provides products and services to customers throughout the United States and more than 130 countries. The company has approximately 115,000 Team Members employed at more than 400 facilities and offices in the United States and around the world. Through its Core Values, Code of Conduct and Team Member Bill of Rights, Tyson strives to operate with integrity and trust and is committed to creating value for its shareholders, customers and Team Members. The company also strives to be faith-friendly, provide a safe work environment and serve as stewards of the animals, land and environment entrusted to it. The Tyson Foods, Inc. logo is available at http://www.globenewswire.com/newsroom/prs/?pkgid=3224. Syntroleum Corporation owns the Syntroleum® Process for Fischer-Tropsch (FT) conversion of synthesis gas derived from biomass, coal, natural gas and other carbon-based feedstocks into liquid hydrocarbons, the Synfining® Process for upgrading FT liquid hydrocarbons into middle distillate products such as synthetic diesel and jet fuels, and the Bio-Synfining(R) technology for converting animal fat and vegetable oil feedstocks into middle distillate products such as renewable diesel and jet fuel using inedible fats and greases as feedstock. The 50/50 venture -- known as Dynamic Fuels -- was formed to construct and operate multiple renewable synthetic fuels facilities, with production on the first site beginning in 2010. The Company plans to use its portfolio of technologies to develop and participate in synthetic and renewable fuel projects. For additional information, visit the Company's web site at http://www.syntroleum.com/. 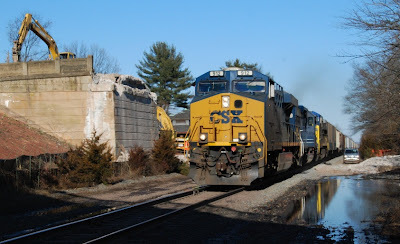 Back in April 30, 2011, I headed down towards CSX's Trenton Line @ Belle Mead (NJ) and was fortunate enough to catch eastbound CSX Q190. It is seen passing beneath the old Route 206 highway bridge and by one of the two buildings that were once part of the ex-Reading's station here. 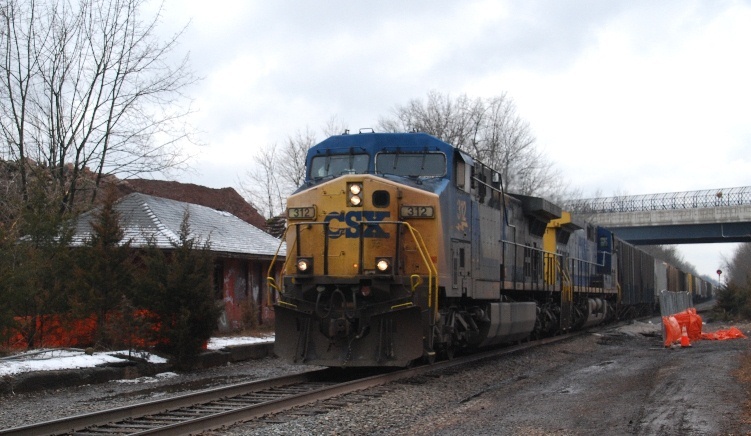 One year later on February 11, CSX K533 is seen passing by the same location under gray skies. Motive power on this Saturday was CSX 312 and CSX 231. Gone is the Route 206 bridge as it has been replaced by the bridge in the background. 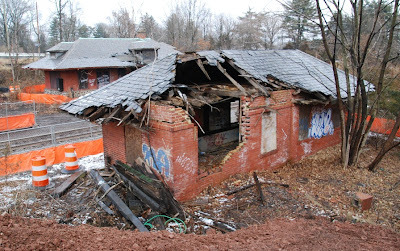 As for that station's waiting area, that is in desperate need of some mason work if it is ever to be used again as part of NJ Transit's plans to utilize this line for passenger service. Some more of the CNJ Newark Bay Drawbridge is finally being removed! BAYONNE - The Army Corps of Engineers has advised the city of Bayonne that the New York/New Jersey Harbor Deepening Project will be drilling and blasting in Newark Bay for approximately one week, beginning on or about Monday, Feb. 13. The goal of that project is to create deeper lanes for shipping in local bodies of water. The project’s contractor, Northeast Dredging Company, will be drilling and blasting concrete footings of the old Newark Bay railroad bridge. That bridge used to carry passengers trains over Newark Bay between Bayonne and Elizabeth. The bridge was demolished three decades ago. Anyone with concerns or complaints about the harbor deepening activity in Newark Bay should call the Army Corps of Engineers hotline at 201-339-6470. The blasting will be performed only during daylight hours, and not on Sundays or federal holidays. JACKSONVILLE, Fla., (February 8, 2012) - Earlier today, the Board of Directors of CSX Corporation (NYSE: CSX) approved a $0.12 per share quarterly cash dividend on the company's common stock. The dividend is payable on March 15, 2012, to shareholders of record at the close of business on February 29, 2012. NORFOLK, VA. – Scott R. Weaver has been named vice president labor relations for Norfolk Southern Corporation, with headquarters in Norfolk, effective March 1. He will report to John P. Rathbone, executive vice president administration. Weaver succeeds Harold R. Mobley, who retires after a 44-year career in the railroad industry. Weaver joined Norfolk Southern in 1989 as a labor relations specialist and served in various positions of increasing responsibility in the labor relations department until being named assistant vice president labor relations in 2008. He holds a Bachelor of Arts degree in Economics from Davidson College. Mobley, who holds a Bachelor of Arts degree in History from Valparaiso University, began his railroad career with Penn Central as a yard brakeman in 1968. 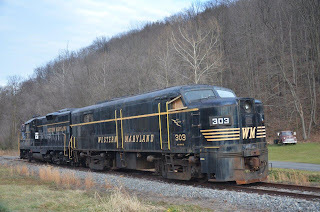 He joined Southern Railway Company (a Norfolk Southern predecessor) in 1971 as a management trainee. He served in a number of positions in the engineering, transportation, and labor relations departments and was named vice president labor relations in 2008. 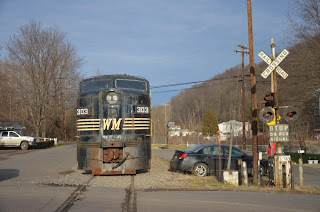 On January 29th, I ventured down to Belle Mead (NJ) in order to check on the old Route 206's status to see if its demolition was starting. Ritacco Construction had started to prepare for the span over CSX's Trenton Line for its removal. Fast forward to the afternoon of February 3rd and that old span was now history! The speed with which the span was dismantled was amazing. Two images what it looked like on February 3rd. The northbound mixed freight is CSX Q410 and (southbound) CSX K532 leader is CSX 912. Can't wait to capture the next phase of this construction, namely the removal of the bridge abutments. JACKSONVILLE, Fla., (February 7, 2012) - Fredrik Eliasson, CSX Corporation (NYSE: CSX) executive vice president and chief financial officer, will address the Stifel Nicolaus Transportation & Logistics Conference in Key Biscayne, Florida on Tuesday, February 14, at 8:30 a.m. Eastern Time. NORFOLK, VA. – James A. Squires, executive vice president finance and chief financial officer of Norfolk Southern Corporation, will address the Stifel Nicolaus Transportation Conference at 9 a.m. EST on Tuesday, Feb. 14, 2012, in Key Biscayne, Fla. Interested investors can listen via simultaneous webcast at http://www.media-server.com/m/p/p5i762cp. 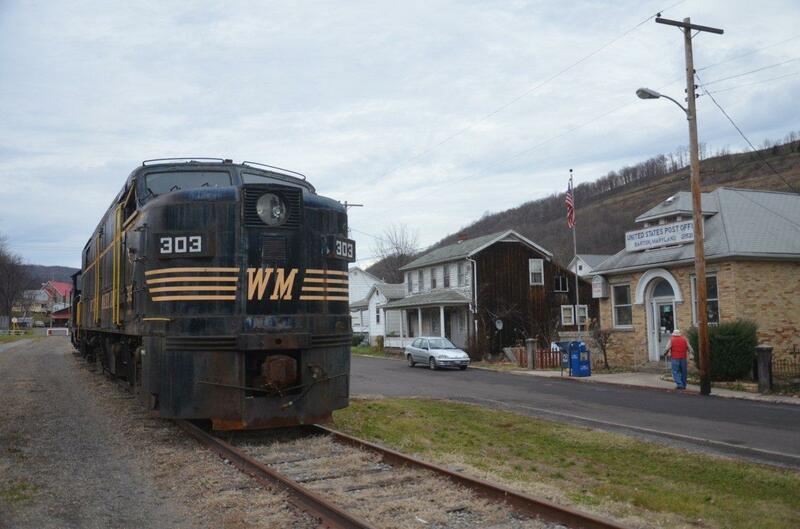 After the webcast, the presentation will be posted at http://www.nscorp.com/. While taking a close friend home to the Charleston, WV area yesterday (12-22-11), We stopped by the George's Creek Rwy only to find them readying the locomotives for their first run on the railway! 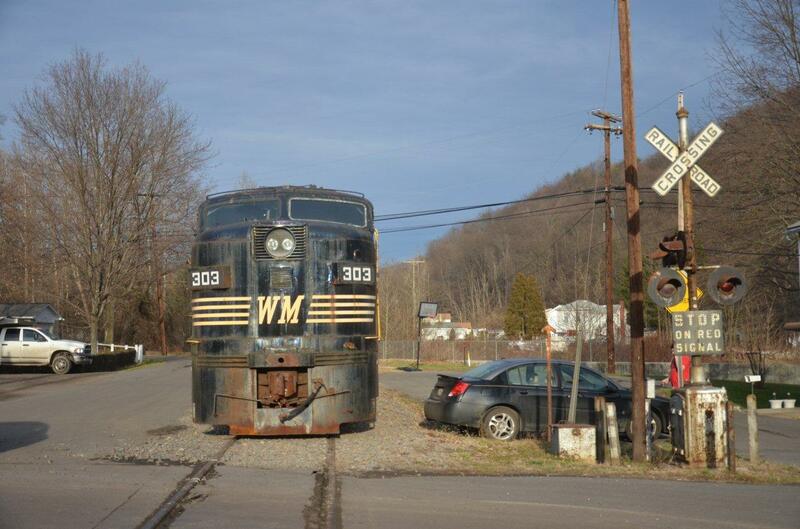 It was a wonderful way to close out an interesting year with some original WM locos running on WM Trackage! Long Live THE Wild Mary!!! Thanks to Gerald Altizer and his crew for allowing us access to this historic event. JACKSONVILLE, Fla. - January 23, 2012 - CSX Corporation (NYSE: CSX) today announced fourth quarter 2011 earnings of $0.43 per share, versus $0.38 per share in the same period last year. This represents a 13 percent year-over-year improvement in earnings per share and a fourth quarter record. The results were driven by revenues of nearly $3.0 billion, operating income of $841 million and an operating ratio of 71.5 percent. "CSX once again delivered record earnings per share while investing in resources to support high customer service levels and growth in the near- and long-term," said Michael J. Ward, chairman, president and chief executive officer. "Our performance in 2011 has set a strong foundation for growth, and CSX remains committed to achieving a 65 percent operating ratio by no later than 2015." For the full year, CSX generated record performance in revenue, operating income, operating ratio and earnings per share. Revenues increased 10 percent to $11.7 billion, operating income rose 11 percent to $3.4 billion, the operating ratio improved to 70.9 percent, and earnings per share improved 24 percent to $1.67. CSX executives will conduct a quarterly earnings conference call with the investment community on January 24, 2012, at 8:30 a.m. Eastern time. Investors, media and the public may listen to the conference call by dialing 1-888-327-6279 (888-EARN-CSX) and asking for the CSX earnings call. (Callers outside the U.S., dial 1-773-756-0199). Participants should dial in 10 minutes prior to the call. In conjunction with the call, a live webcast will be accessible and presentation materials will be posted on the company's website at http://investors.csx.com/. Following the earnings call, an internet replay of the presentation will be archived on the company website. CSX Corporation, based in Jacksonville, Fla., is one of the nation's leading transportation companies, providing rail, intermodal and rail-to-truck transload services. The company's transportation network spans approximately 21,000 miles, with service to 23 eastern states and the District of Columbia. CSX's network connects to more than 240 short line and regional railroads and more than 70 ocean, river, and lake ports. More information about CSX Corporation and its subsidiaries is available at http://www.csx.com/. This information and other statements by the company may contain forward-looking statements within the meaning of the Private Securities Litigation Reform Act with respect to, among other items: projections and estimates of earnings, revenues, volumes, rates, cost-savings, expenses, taxes, liquidity, capital expenditures, dividends, share repurchases or other financial items, statements of management's plans, strategies and objectives for future operations, and management's expectations as to future performance and operations and the time by which objectives will be achieved, statements concerning proposed new services, and statements regarding future economic, industry or market conditions or performance. Forward-looking statements are typically identified by words or phrases such as "will," "should," "believe," "expect," "anticipate," "project," "estimate," "preliminary" and similar expressions. Forward-looking statements speak only as of the date they are made, and the company undertakes no obligation to update or revise any forward-looking statement. If the company updates any forward-looking statement, no inference should be drawn that the company will make additional updates with respect to that statement or any other forward-looking statements. JACKSONVILLE, Fla. - January 23, 2012 - CSX Corporation (NYSE: CSX) today announced the appointments of Oscar Munoz as executive vice president and chief operating officer and Fredrik J. Eliasson as executive vice president and chief financial officer, effective immediately. Munoz replaces David A. Brown, who is no longer with the company. The company's decision to make this change is unrelated to CSX's financial condition, business performance or outlook, all of which are strong. "Oscar Munoz is a proven leader who has been an integral part of creating the company's vision and success," said Michael J. Ward, chairman, president and chief executive officer. "He brings tremendous business skills, a disciplined approach and a passion for superior results." Munoz has been executive vice president and chief financial officer of CSX since 2003, responsible for all financial, strategic planning, information technology, procurement and real estate activities. Prior to joining CSX he held senior leadership roles at PepsiCo, Coca-Cola and AT&T. Munoz is a member of the board of directors of United Airlines, as well as several local and national educational and philanthropic institutions. He earned a bachelor's degree from the University of Southern California and a master's of business administration from Pepperdine University. Succeeding Munoz as chief financial officer is Fredrik Eliasson, a 16-year veteran CSX executive. "Fredrik brings broad senior leadership experience and a track record of success in key financial and commercial roles," said Ward. "He has invaluable insight into creating value for shareholders and customers, as well as clear focus and skill in business execution." Eliasson was vice president of sales and marketing for CSX's chemicals and fertilizer business and previously headed the emerging markets business. Before that, he was vice president of financial planning and analysis, overseeing all aspects of planning, forecasting and economic analysis activities. Eliasson is on the board of directors of the Jacksonville Chamber of Commerce. He earned a bachelor's degree and a master's degree in business administration from Virginia Commonwealth University.